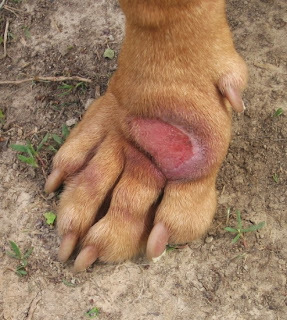 Acral lick dermatitis is also known as lick granuloma and acral pruritic nodule. It is a skin disease mostly found in dogs due to excessive licking. It is one of the most usual and vexing dermatological problems seen in general practice. It is now believed that this disease is being caused by a multiple factor disease. There have been attempts to manage this disease with a single treatment which normally results in failure. Lesions are single but they could be multiple. Large breeds such as German Shepherd Dog, Great Dane, and Labrador Retriever etc are predisposed. This disease may occur at any age, but it happens usually in dogs more than 5 years of age. Lesions maybe be at either one or different sites. Lesions are maintained by continuous licking or chewing. The lesion is characterized by bald, red, eroded or ulcerated, firm, nodular plaque. This disease can be controlled with medicine and/or behavior management. However, even after the identification and treatment of underlying problem, concurrent treatment of the skin is vital. It is essential to treat the associated secondary bacterial infection with 6-8 weeks antibiotics. Treatment of this condition can be difficult and in few cases surgical removal of affected area is required. Several devices to stop licking are required: Elizabethan collar, bad tasting topicals, basquet muzzle, bandaging. Few drugs such as hydroxyzine (Atarax) and tricyclic antidepressants etc are used to alleviate anxiety. The successful treatment of this disease depends on a thorough investigation of potential underlying causes and systemic, behavioral, topical and surgical methods of treatment.